This is a recipe out of one of the very first cook books I received, the Better Homes and Gardens Cook Book, 11th edition. I haven’t made a whole lot from this book, but I like that it has a lot of cooking tips and pointers throughout the book. 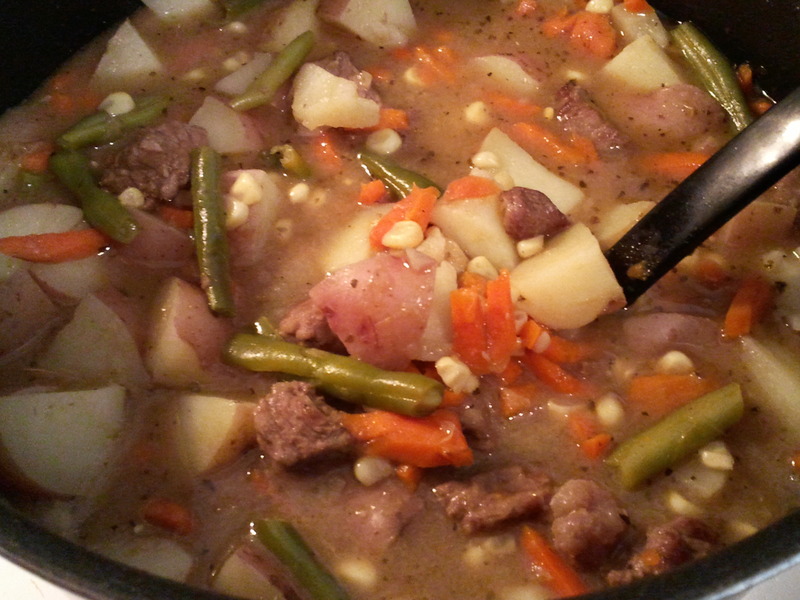 This is a very tasty stew, and even though it’s a little warm out for stew now, I still wanted to make it. 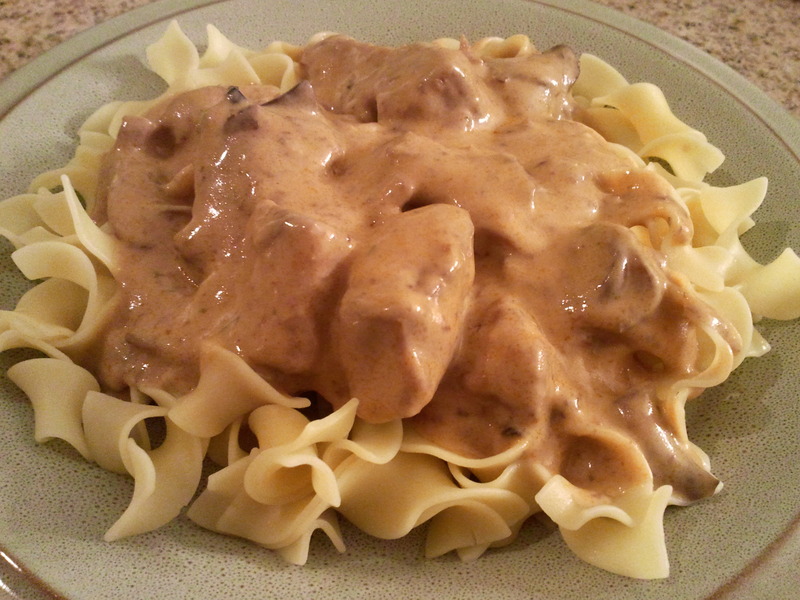 I did it on the stove top, which is very time-consuming, but you can do it in the slow cooker as well. I just forgot to get it in the slow cooker this morning! Place flour in a plastic bag. Add meat cubes, shaking to coat. In a large saucepan or Dutch oven, heat oil. Add meat and brown; drain fat. 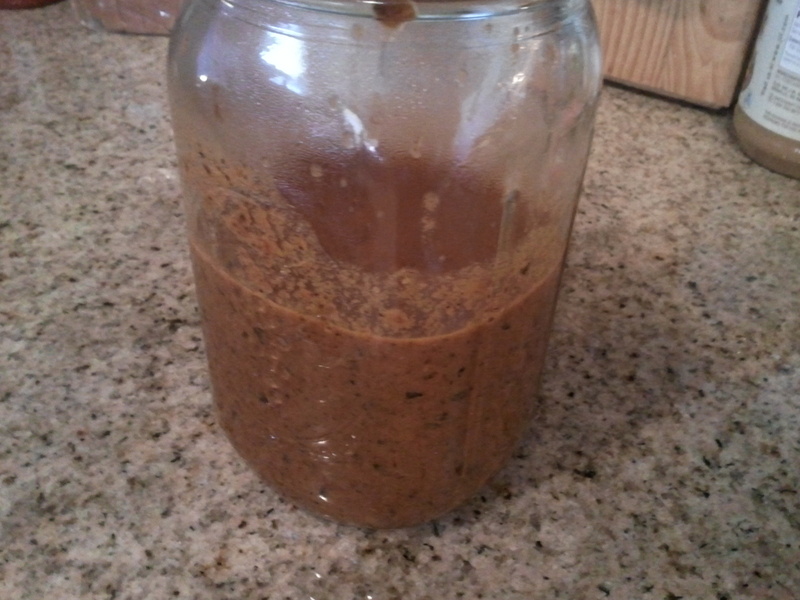 Stir in beef broth, water, onion, Worcestershire sauce, bouillon cube, oregano, marjoram, pepper, and bay leaf. Bring to boiling; reduce heat. 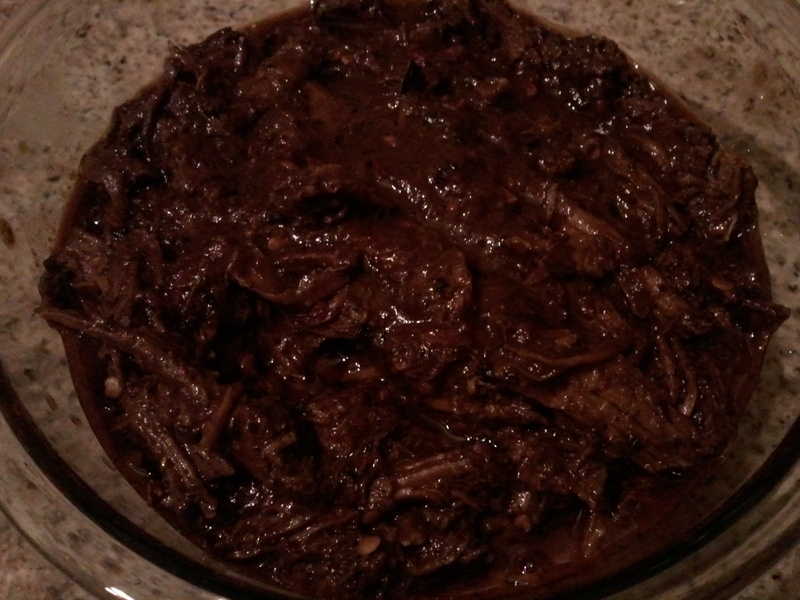 Simmer, covered, for 1 to 1 1/2 hours or until meat is nearly tender. Stir in potato, green beans, corn, and carrot. Return to boiling; reduce heat. Simmer, covered, about 30 minutes more or until meat and vegetables are tender. Discard bay leaf. Makes 5 servings (about 7 cups). Prepare and brown meat as above. In a 3 1/2- or 4-quart slow cooker, layer meat, onion, potatoes, green beans, corn, and carrot. Decrease beef broth to 2 cups. Combine beef broth, water, Worcestershire sauce, bouillon cube, oregano, marjoram, pepper, and bay leaf. Pour over meat and vegetables in slow cooker. Cover and cook on low-heat setting for 10 to 12 hours or on high-heat setting for 5 to 6 hours or until meat and vegetables are tender. 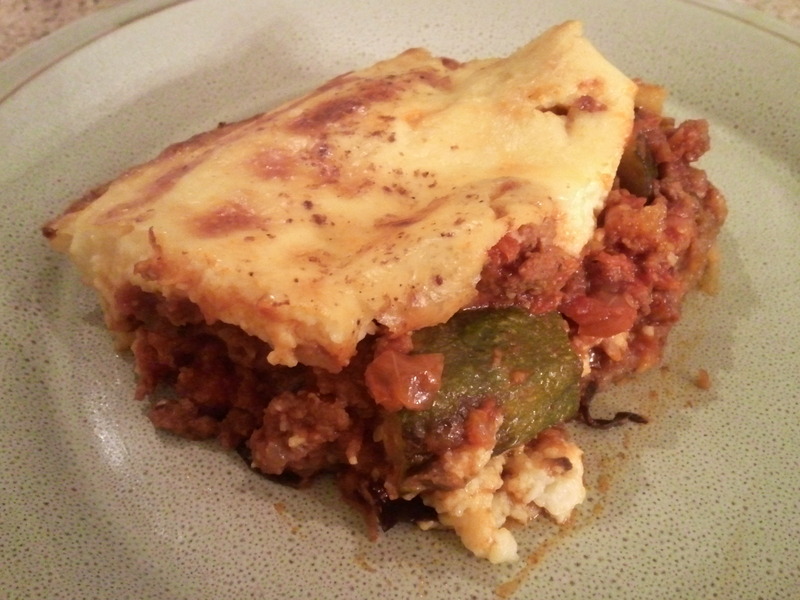 Moussaka and Pastitsio all in one! I tried to think of a new name for this, but with the migraine I have, I’m not feeling too creative at the moment. 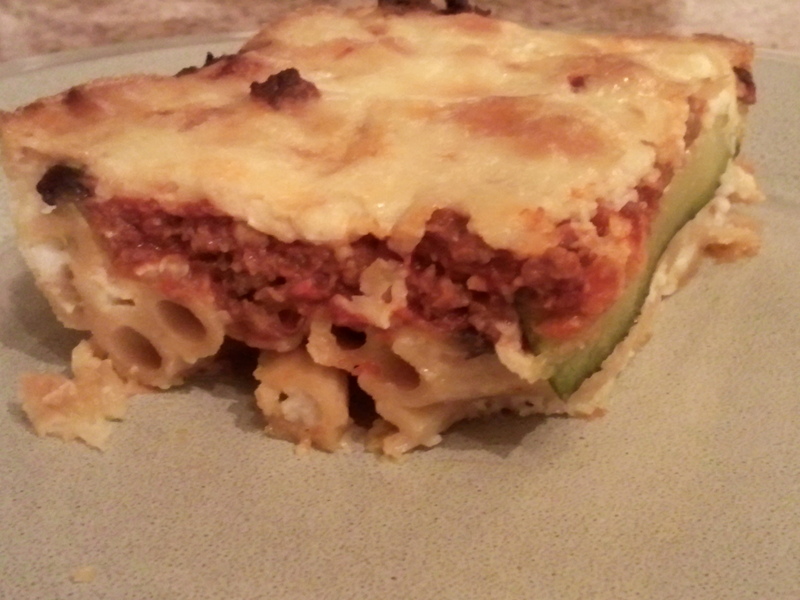 This is a combination of 2 of my favorite Greek dishes, Moussaka and Pastitsio. I got the Italian themed veggie pack from Bountiful Baskets this week, and it had an eggplant and a zucchini. Not really enough to make Moussaka or something like Eggplant Lasagna, so I decided that adding some pasta, like in Pastitsio, it would make a great meal. I was right, it turned out great. I put the pasta on the bottom, then the zucchini and eggplant, then the meat sauce, then the bechamel sauce. Sprinkle eggplant slices with salt and set on paper towels for 15-20 minutes to let them drain. Pat tops with a paper towel. Spray or brush each side of the eggplant and zucchini slices with olive oil and lay in a single layer on a baking sheet. Bake in oven for 10 minutes, flip slices over and bake for another 10 minutes, until they are tender and slightly brown. Boil macaroni according to package; drain; return to pan. Melt the 1/4 cup butter, beat in egg, and stir in with macaroni. 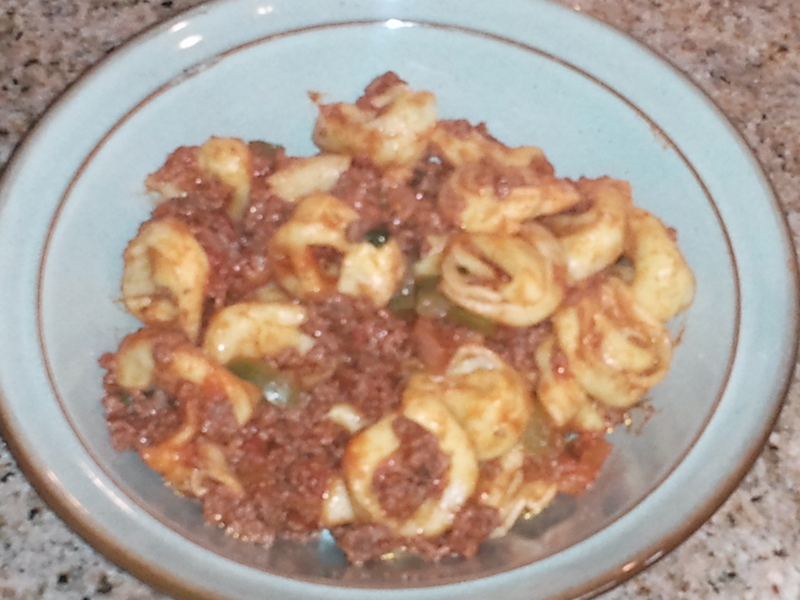 In a skillet, brown onion and ground beef or lamb. Add tomato paste, and seasonings. Cook for 5 – 10 minutes. Make cream sauce. Melt 1/4 cup butter and pour in 1/4 cup flour; brown slowly. Beat 2 eggs with 2-1/2 cups milk, salt, and pepper, and pour into butter and flour mixture very slowly; mix well. Cook over low heat until it thickens. To assemble, grease a 9 x 13 pan. Add macaroni mixture to pan and press down with a piece of wax paper. Sprinkle generously with the grated cheese. 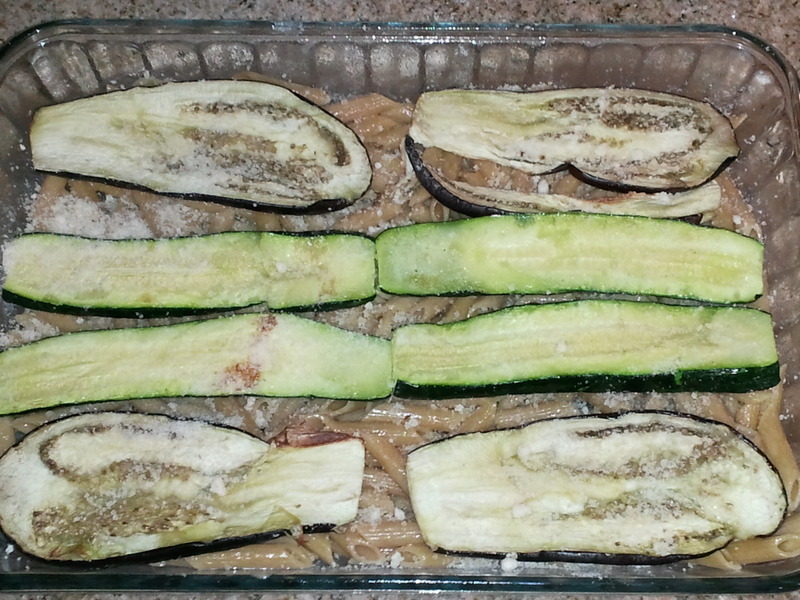 Lay out eggplant and zucchini in a single layer. Sprinkle with grated cheese. Spread the meat sauce evenly. Pour cream sauce evenly on top. I first got this recipe from a cookbook from my mother-in-law, Favorite Brand Name Recipes. The original recipe calls for a pouch of Lipton onion soup mix. I don’t normally have Lipton onion soup mix on hand, and I always seem to forget it, so I improvise. The ground beef, spinach and cheese are the same, I just out other things in place of the soup mix. And I think the results are fantastic. Tonight, I made this on my outdoor grill (have to keep using it to get my money’s worth out of it, right? 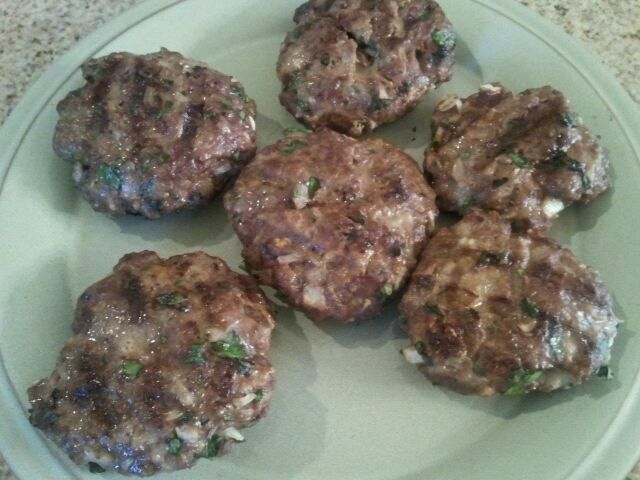 ), but I have made these on the George Foreman indoor grill and they are great as well. In a large bowl, combine all the ingredients. Form into 8 patties. Cook as desired, until no longer pink. I had ZERO motivation for dinner tonight. I had fully intended to make Cabbage Rolls today, but after prepping all of my Bountiful Baskets veggies, I was worn out. 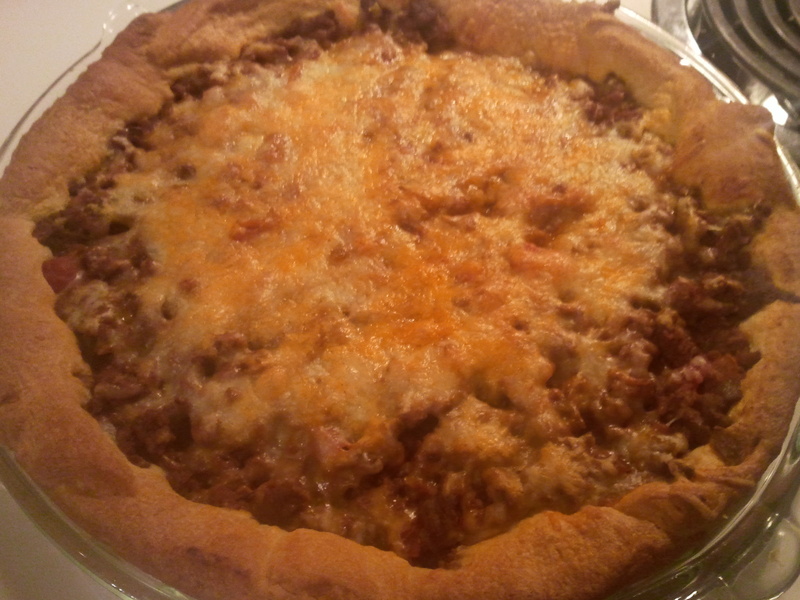 So, I had crescent rolls that needed to be used and thought some kind of taco pie sounded good. I found this on the Pillsbury website, and it was quick and easy to make for dinner, plus tasted good. Grease a 9″ deep dish pie plate. Separate crescent roll dough into the 8 triangles. Press into the pie dish, covering bottom and sides. In a medium-sized skillet, brown ground beef. Drain any excess grease. Stir in the taco seasoning and the salsa. Simmer for 5 minutes. Pour into the pie dish. Cover top with the shredded cheese. Bake in the preheated oven for 20-25 minutes, or until cheese is melted and crust is golden brown. 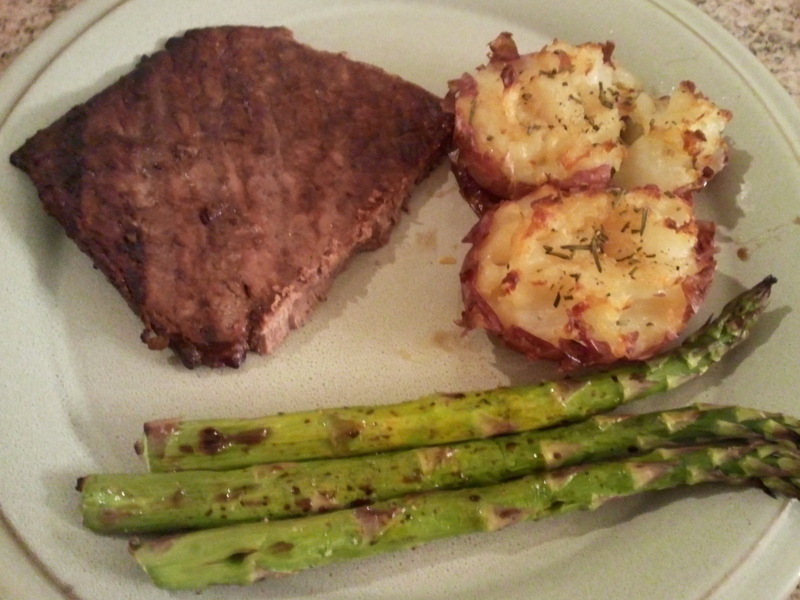 This dinner was definitely not in the Weekly Meal Plan, but it certainly came together perfectly to use some of the potatoes and asparagus I had gotten from Bountiful Baskets this week. I had seen these potatoes on Pinterest a while back, but apparently hadn’t pinned it, so I had to search again and luckily found it. I luckily had fresh rosemary from the Italian veggie themed pack still to use for the potatoes. I then decided I should make either steak or chicken on the grill since I am trying to get good use out of my new grill. I decided it would be a good idea to grill the asparagus too, just to avoid another dirty pan and again, utilize the grill. 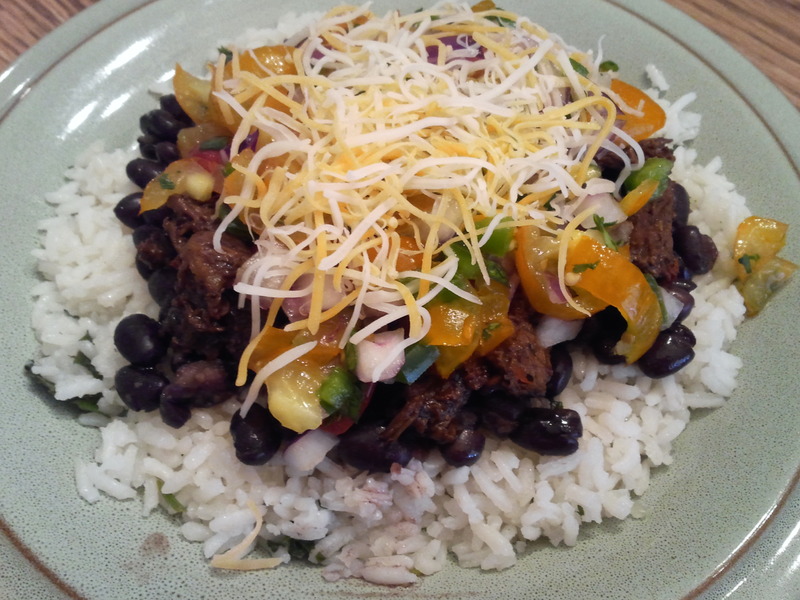 It all turned out delicious and got rave reviews from the whole family. Wash potatoes thoroughly. Add to a large pot and add enough water to just cover potatoes. Bring water to a boil and cook potatoes until just tender, about 20 minutes. Drain. Grease a baking sheet thoroughly with oil. Lay out the 12 potatoes. Slightly mash each potato with a potato masher, turn potato masher 90 degrees and slightly mash each potato again. Brush each potato with olive oil, then sprinkle on salt, pepper, and fresh rosemary. Bake for 20-25 minutes, or until golden brown. 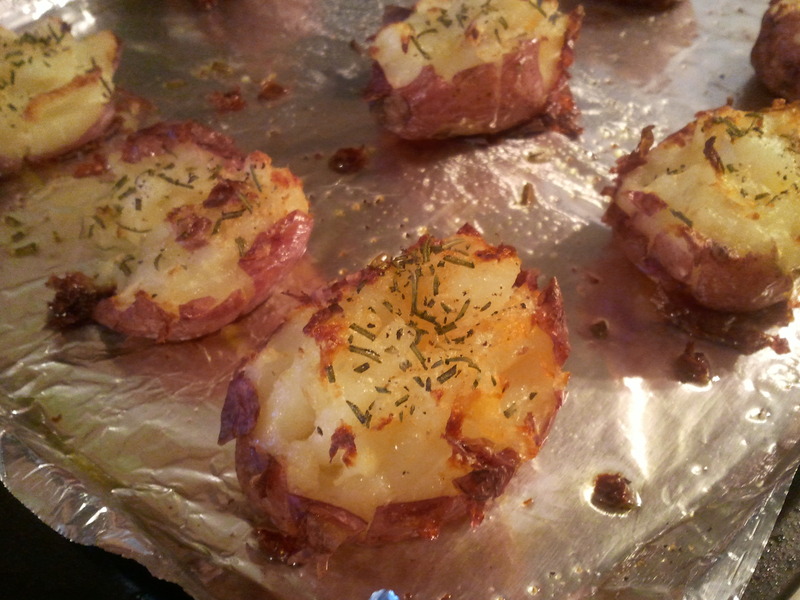 Remove from oven and splash each potato with malt vinegar. 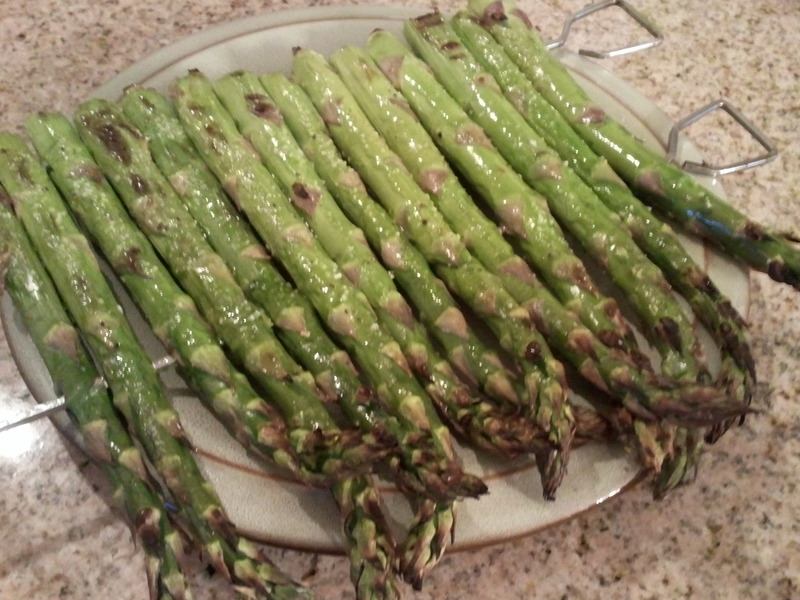 Place asparagus on skewers. Brush with olive oil and sprinkle with salt and pepper. Grill on high heat for a few minutes, or until desired tenderness. Remove from grill and splash with balsamic vinegar. So, the total cost for this meal is $11.54, should have cost $17.08. Not bad to feed the 4 of us for dinner, plus enough leftover for 1 person’s meal. And, a $5.54 cost savings may not seem like much, but that savings over time would add up quickly. Last year for New Year’s Day, I cooked a variety of Greek dishes for my family, and continued on with that tradition this year. It’s the best time to make all this food, lots of hands here to help with the preparations. 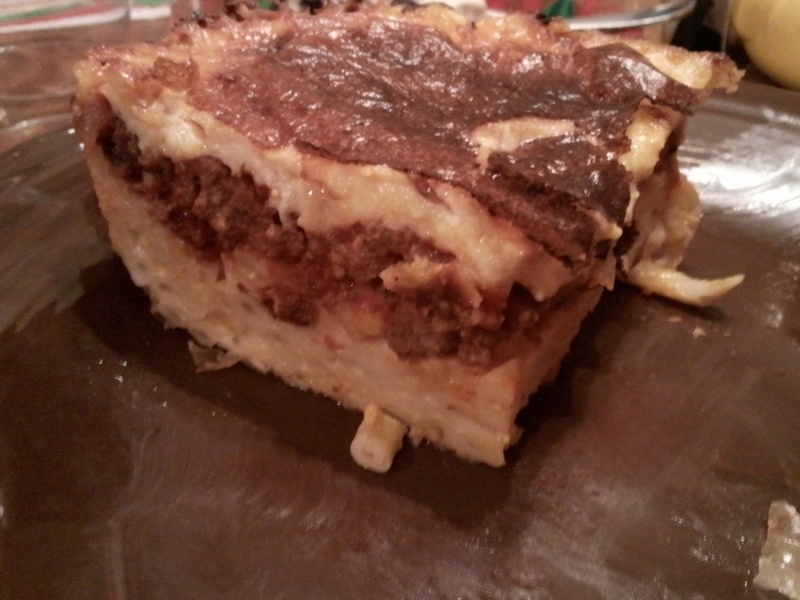 I really love Pastitsio. It’s almost like a lasagna or baked Italian pasta dish would be, just seasoned a little differently. It’s a little time-consuming to get all the parts done, but worth it in the end. This can be made up ahead of time and frozen just before baking, then thawed and baked when you are ready to have it. Boil macaroni according to package; drain; return to pan. Melt the 1/2 cup butter, beat in eggs, and stir in with macaroni. Spray a 9″ X 13″ X 2″ pan. Add macaroni mixture to pan and press down with a piece of wax paper. Sprinkle generously with the grated cheese. Meanwhile, in a skillet, brown onion and ground beef or lamb; add tomato paste and seasonings. Cook for 5 – 10 minutes. Spread meat mixture over macaroni noodles in pan and spread evenly. Meanwhile, make cream sauce. Melt 1/4 cup butter and pour in 1/4 cup flour; brown slowly. Beat 2 eggs with 2-1/2 cups milk, salt, and pepper, and pour into butter and flour mixture very slowly; mix well. Cook over low heat until it thickens. Pour over macaroni/meat mixture.